We have also included a link to the First Edition Twin Marker colour chart so you can download and colour in the reference sheet to use as a guide. 1. Stamp the Dovecraft Bohemian clear bird stamp onto a piece of A4 card. The rose was coloured with shades of the pink including the sorbet (43), candy (44) and skin tone porcelain (07) markers. I then highlighted the petals using the crimson (15) and cool grey (02) markers. Tip: Use a small circular motion when colouring to give you streak free colouring. 2. The pistachio (25) twin marker was perfect for colouring the stems around the bird. To create shading around the steams, I used the grass (27) twin marker. I also used these markers along with the pine marker (30) for the larger leaves. I then added various shades of yellow for the smaller blooms including the primrose (37), warm yellow (40) and lemon (38) marker. Tip: Use a lighter shade marker pen to help blend shades together while the ink is still wet to give effortless blending. 4. To add a contrast in colours, I coloured the bud using the purples twin marker pack. I coloured the tip using the lilac (33) marker and added graduation with the lavender (32) marker. To finish, I used the amethyst marker to create a more realistic flower. Tip: Store your marker pens flat so the colour doesn’t settle at one end and dry the pens out. 5. Cut the Dovecraft Bohemian 6” x 6” floral paper into a 15cm square. Stick to the front of the kraft card blank with double sided tape. 6. With the distressed grid paper, cut out a doily using the First Edition Doily set. Cut in half and add to the bottom right of the card. 7. Cut the pink floral paper to an 11.5cm square and layer onto a piece of kraft card which has been cut to a 12cm square. Add to the top left of the card at an angle. 8. Cut a strip of kraft cardstock to 6.5cm x 14cm, mat and layer with a 13.5cm x 6cm piece of the striped glitter paper. Stick the panel to the centre of the card. 9. Mat the coloured stamp on to a 9.5cm square of kraft paper and stick on top of the striped paper at an angle. 10. Add a wooden rose to the bottom left corner and butterfly topper to the top right corner of the stamped image. Cut out a large butterfly from repeat butterfly print paper, bend the wings gently and stick to the centre of the topper and decorate with three adhesive gems. 11. Stamp the 'With Love' sentiment onto the piece of the distressed grid paper and cut to 5.6cm x 1.7cm paper. 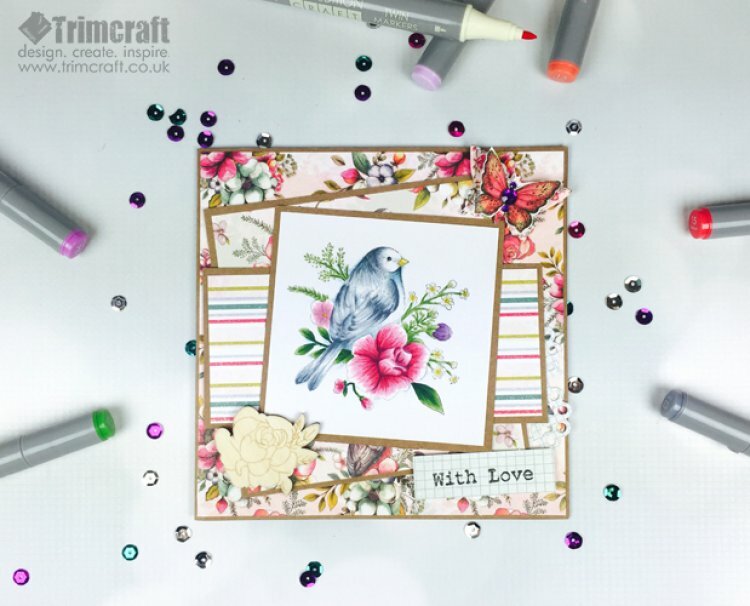 Stick to the bottom right of the card using Dovecraft foam squares. Have you made anything using the new First Edition Graphic Markers yet? We would love to see your colourful creations in the project gallery!